The experience I had at Cioppino’s was actually a very tough call for me. In terms of quality of the food, execution, service and presentation it all ranged for good to great. However I left the restaurant disappointed and the feeling has lingered for a while. In order to have a satisfying meal at a restaurant, sometimes it is as much about meeting expectations in addition to good execution. In the end, nothing was a miss about my meal at Cioppino’s but it didn’t meet my expectations. Ciopinno’s is a well-lauded restaurant run by Chef Pino Posteraro. Just a browse at their menu, and it ranks amongst the most expensive dining destinations in the city. There are only a handful of restaurants in Vancouver, which commands a level of respect that my casual self feels obligated to dress up for dinner. Cioppino’s is one of them. So perhaps, unfairly to Cioppino’s, what I expected from my visit was pretty high and it got further amped up when I arrived at the eatery. Here’s the context for the meal at Cioppino’s and what went down. I work for a small company owned by a fellow food enthusiast. For the company’s celebration and appreciation dinners my co-workers and I have had the great fortune to experience omakase at Tojo’s, Miku & Ki. In addition we have feasted on wonderful multicourse dinners at Blue Water Café, Gotham and Yew Restaurant. Upon arriving at our table for our company’s year-end holiday dinner at Cioppino’s, our boss had a surprise for us. He had asked Chef Pino Posteraro to cook for us. The chef came out and asked about the number of courses we wanted, preferences and allergies. Immediately, mother of pearl spoons were laid out at each of our place settings. You can see why I had sky expectations from Cioppino’s, talk about setting the bar high. Regarding the photos, Ciopinno’s is filled with yellow light and dim; so I did my best to enhance the photos to give a better representation of the food I was served. 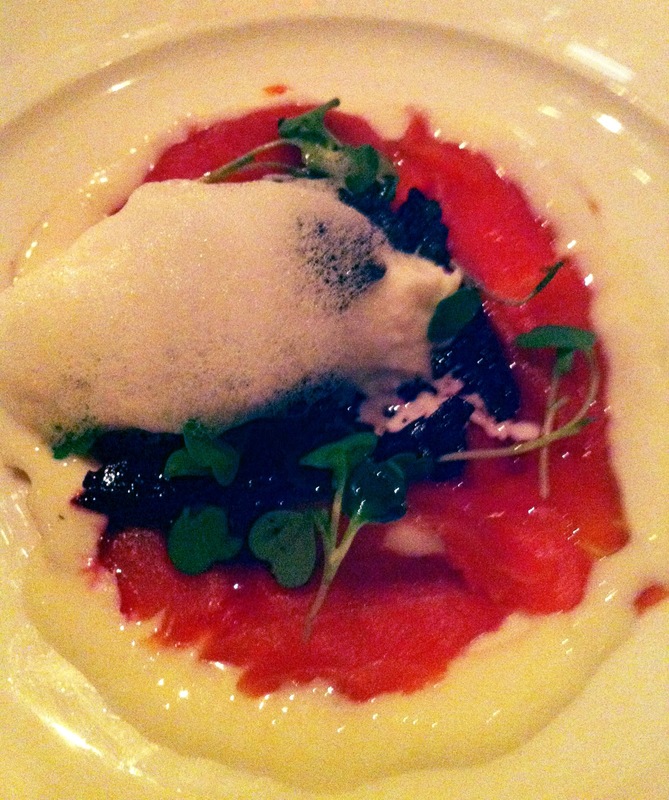 The first appetizer was house smoked salmon topped with caviar, buffalo mozzarella and vegetable foam. It was a special creation not found on the menu. The quality of the ingredients was top notch and it was a great first course to stimulate the palate. Next was a scallop dish. It is available on the regular menu and consists of oven roasted Qualicum Bay scallops with sweet tomato confit and tender artichokes. Now here’s the thing about scallops, they don’t really have any taste to them so it’s really important for the other components of the dish to help out with the flavour. Although prepared perfectly (I wouldn’t expect anything less from this caliber of restaurant) I thought this item was one note with just the tomato confit standing out and really didn’t have a wow factor. Now the next items were very flavourful and were fantastic. We were presented with a tasting of the Pappardellewith 4 hour-braised veal cheeks and porcini mushrooms and Paccheri di Gragnano (artisanal tubular pasta with Saltspring Island lamb sausage). Both are found on the regular menu. The pasta was cooked perfectly and were rich, complex and savoury . You just wanted to eat more and more with each bite. There were big smiles at our table with these two pasta dishes and based on them we understand why Chef Posteraro & Cioppino’s is so acclaimed. 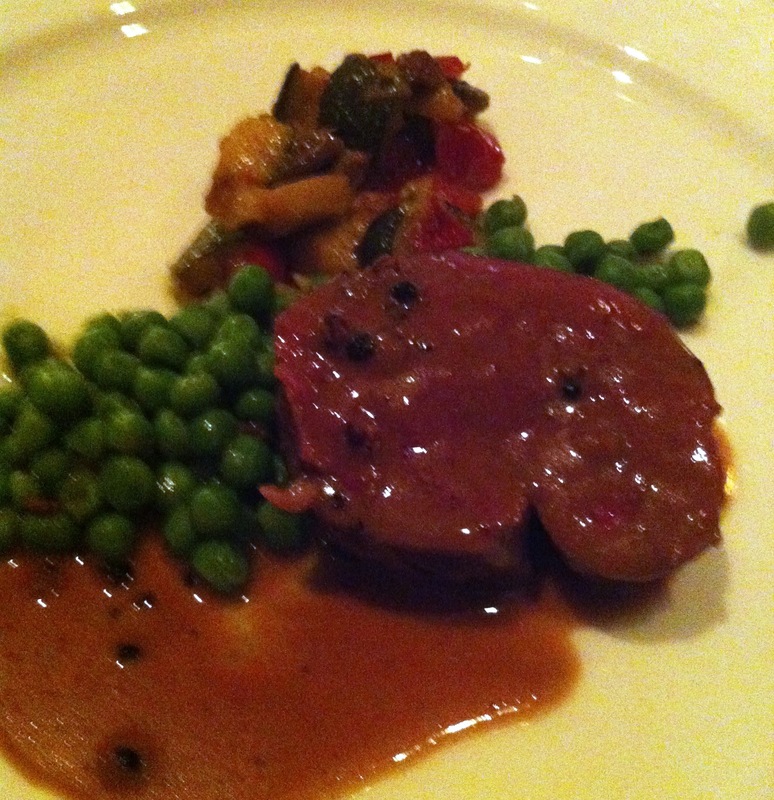 Up next was the Triple “A” beef tenderloin served with a classic black peppercorn sauce, peas and a ratatouille. The tenderloin was great but I felt it was by default because of the quality of the cut of meat used. The other components of the dish were pedestrian. 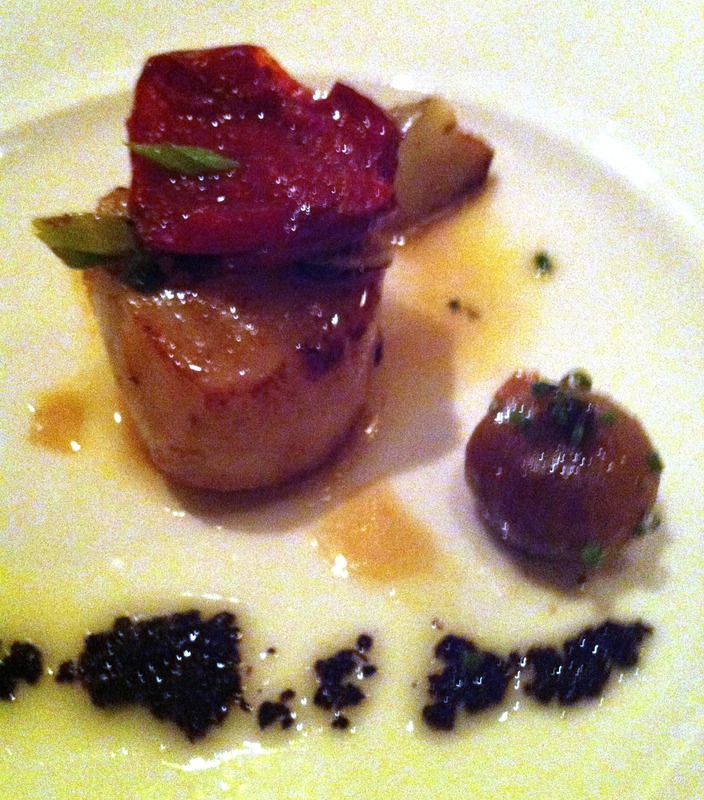 Like the scallop it was well prepared but it didn’t have a wow factor. At this point, our meal was to end with our choice of dessert, but we still wanted more food. 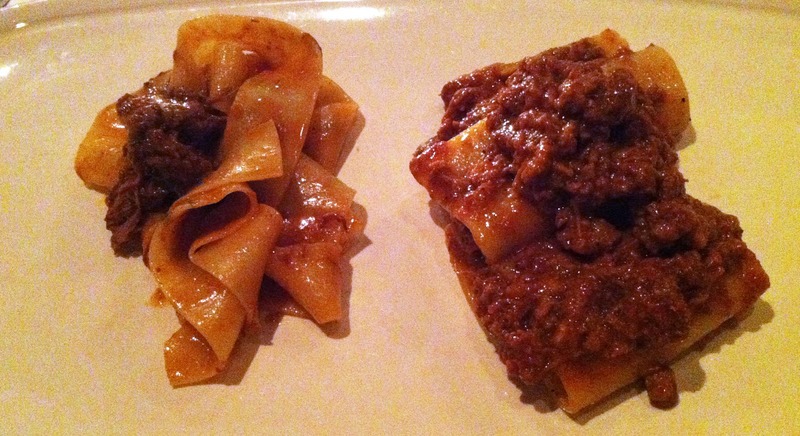 Our boss asked our server if we could have a special pasta dish since the pastas were the highlight our meal thus far. 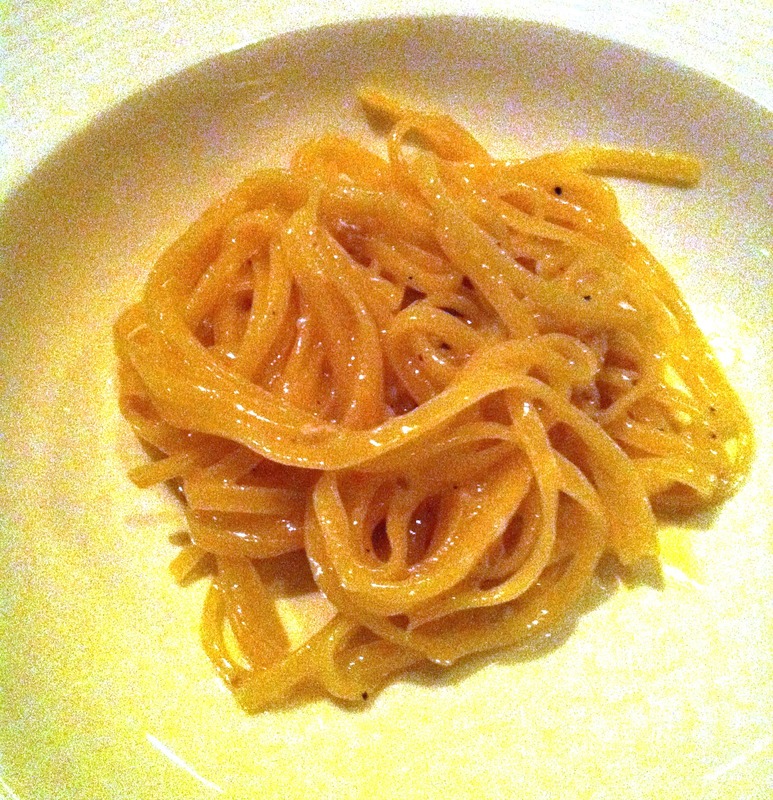 The server suggested the Chef could prepare a Tagliolini with white truffles for us. White truffles are expensive (from what I researched $269 per ounce, YIKES) and this pasta dish was definitely not available on the menu. Chef Pino Posteraro was liberal with the use of the white truffle. This pasta was simple, a great showcase for the white truffle and as a result delicious. I concluded my meal with the mascarpone soufflé with sorbet with citrus and lime macaron. The serve added a white chocolate sauce into the soufflé. The soufflé was light, faintly sweet and rich. The sorbet complimented the soufflé perfectly as it was refreshing with a subtle hint of citrus. The macaron had a slight crisp on the outside was light but had a slight chewiness on the inside. However I found its lime flavour too overwhelming to compliment the other items of my dessert. When Chef Pino Posteraro agreed to cook for our table, I expected showmanship and a unique eating experience. With the exception of the Smoked Salmon appetizer and the White Truffle pasta, although prepared well and the duo of pasta was phenomenal, the remaining items you could get any day of the week off the regular menu. Also another problem we experience was that since we didn’t know what dishes the chef had selected for us, an explanation at the arrival of each dish would have been appreciated. Chef Pino Posteraro did explain the first dish but we noticed the restaurant fill up during our time there, so we didn’t expect the chef to come out for each dish. However the server could have introduced each dish but often didn’t. My boss had to ask what we were eating. Perhaps my experience with Omakase at Japanese restaurants skewered my expectations. At a Japanese restaurant, when you ask a chef to personally cook for your party, you get the best the chef has to offer and often it’s unique dishes or ingredients that are not available on the regular menu. In addition, whether it’s the chef or the server, dishes are always explained at Omakase. If my expectation were more tempered and not super high, this would have been an excellent dinner. Maybe if we had just walked off the street and ordered off the menu this post would a be “Wow, you’ve got something there!” post instead of a WTH post. In the end, Cioppino’s is a quality restaurant, but I would definitely stick to the pasta section of the menu. Next Post Food for Thought: Why the F@#$%&#($*%&* do some people think Big Portions EQUALS good FOOD/EATERY!!!!!!!!!!!!!!!! !